Join us for the last event of the semester in the Persica Forum. Friday, December 22nd at 6:00PM in 208 Knox Hall. From 1999 to 2005, Amir was a Director of Fortune Asset Management Ltd., a leading, London-based alternative investment management firm, which is majority-owned by Close Brothers, the second largest alternative investment firm in Europe. From 2000, Amir headed the NY representative office of Fortune and in 2004 became a Director of the Emerging Manager Program, which seeded several hedge funds. Amir started his career in the hedge fund industry in 1993 as a Consultant to Enigma Investments, the Geneva-based affiliate of Headstart. Headstart (formerly called Folkes Asset Management), is a leading, London-based single and multi-manager alternative investment firm. 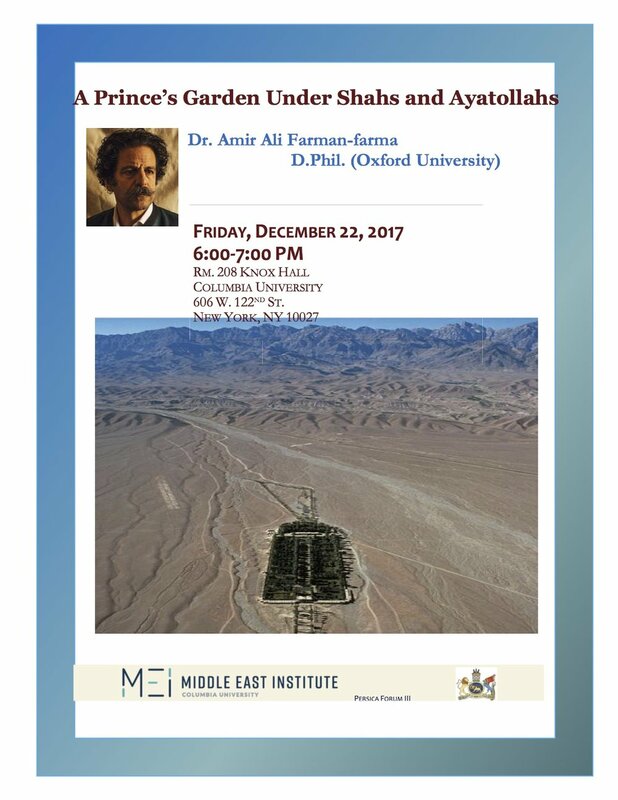 Prior to entering the hedge fund business in 1993, Amir worked as Senior Consultant at Middle East Consultants (MEC), conducting research and providing consultancy services to Oil & Gas and Financial companies active in the Middle East. His current focus is resources and technology centered private equity funds. Amir is a Board Member (frmr.) of the Near East Foundation (Est.1915), the Flora Family Foundation, and Member of The Synergos Institute (all long-standing, US-based philanthropies). Amir is a Founding Board Member of the Iranian American Political Action Committee. He was elected ‘Global leader of Tomorrow’ at World Economic Forum, Davos (1994). Amir received his B.A. (honours) in 1986 from Harvard University in History and Economics and gained his D.Phil. (Ph.D) in 1991 from St.Antony’s College, Oxford University, in Politics. He also attended the Institut des Etudes Politiques in Paris (1984-1985). Amir has written for the French national newspaper Liberation as well as specialist journals including Petroleum Intelligence Weekly , Nefte Compass and Geopolitics of Energy. He is a former Editor of The Harvard Crimson(1985) and the Harvard International Review (1985).